First things first: Do not even bother reading the synopsis on one of Emily Henry’s books. I said this about “The Love That Split The World” and I’m saying it about “A Million Junes”—you will read that synopsis and may be fooled into thinking it’s something you could pass over. When it comes to stories like Emily’s, it is impossible to relay the MAGIC of the story in a synopsis. 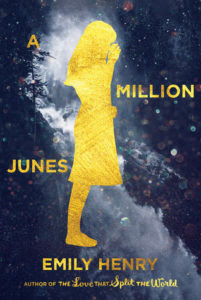 A Million Junes is magic and mystery, people. I was in love and hooked instantly. I could not put this down and even though I’ve been a slow reader these days, I zoomed through this is two short days. Magical realism is my jam, and Emily Henry’s style and characters just do it for me. I loved the focus in this story. Over all, this is a love story, but it encompasses so many different types of love. Familial, platonic, and romantic love all play major roles in this story and I loved the shift in focus rather than focusing in on one romantic interest. I thought the story had great pacing, even through this type of writing I noticed Emily Henry used in TLTSTW. There are these scenes and moments where lots of information and scenery pass rapidly, and it becomes this really cool cinematic experience that I think I will start associating with her. I loved the characters and the world building. I loved the absence of annoying teenage conflict drama. I loved the beautiful writing! Can you tell I loved it? This story is weird and beautiful and creepy and hilarious. (I did have a couple laugh out loud moments and I love that subtle but effective humor) It is sad and relatable and feels true even when it’s wrapped up in magical elements. I know a lot of people aren’t big fans of magical realism, but I very much enjoy it and I really loved this read.